Yes. I know. I know. It has been too long. But I am back now. Things have been very lively in my world. Paz was in town for ten (10) days and she only just left. Don’t worry, you’ll be hearing all about that soon enough as there is much to share. But first I would be remiss if I didn’t share a story with you of an evening that took place right before Paz’s arrival. As long as I’ve lived in my canyon, when I go on hikes and walks and such, I’ve noticed this enormous, old, antique birdcage next to some trashcans behind a house. I’ve always coveted this birdcage. I told Maggie as much. I figured if it was literally sitting next to a trash can, untouched for years, no one would really miss it. Right? It wasn’t officially wrong or steal-y. It was perfectly fine. Right? Well, I guess we didn’t really plot – we decided to bust up there one night after dinner when it was dark. That was the long and short of it. So one particular night, after an especially delicious dinner at home with Maggie and Michael Motorcycle during clean-up, MM and I heard a definitive, “Alright, let’s do this” from behind. We whirled around to see Maggie in full-on burgle gear: all black with black paint under her eyes. She was rocking her “menacing” pose. At that moment I think I peed my pants a little bit. So Maggie, Michael Motorcycle and I all piled into my car and headed up the hill. Laughing hysterically. In the world’s loudest car. In the world’s quietest canyon. At about midnight. Did I mention we neglected to plot? We drive up past the house. We make a u-turn and go back down to idle in front of the house. Michael was on getaway driver duty, Maggie was going to hold up the back gate of my car (it doesn’t stay up by itself) and I was to be the birdcage grabber. It was my mission so, of course, I was to take the biggest risk. Why we didn’t park farther away from the house and walk up, stealth-like, I don’t know. Perhaps the lack of plotting? Anyway, I jump out and after nearly wiping out en route to the trash can area in my Crocs (stupid choice, but I had just been cooking) and arrive face to face with The Birdcage. Now I am a tall woman and this thing was taller than me. The birdcage is massive and cumbersome and worst of all, heavy. And right when I get almost to the car I realize that the base of it had rotted away and that the top and bottom were not attached. The reason I noticed this is that the top fell, with a bang-crash-extreme cacophony, to the street. I'm talking loud. This is also right about when I notice a person a dozen or so yards away, standing in the street. But, I was unyielding. We had come this far, right? At this point I should, perhaps, add that wine may have been involved. And so, while laughing even harder, in the world’s loudest car, in the world’s quietest canyon, after about five years of coveting, I have my birdcage. It really brings the garden together. Michael Motorcycle is going to put an upside down tomato plant inside – or so he says. 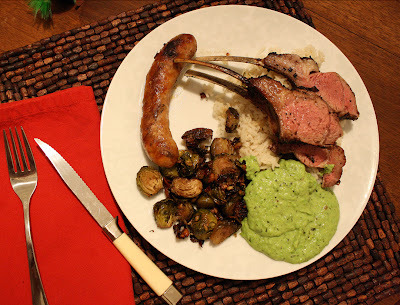 Oh, and that night’s dinner was a beauty: we went to Lindy Grundy on their opening day and bought a Frenched rack of lamb and some of Erika’s special pork kimchi sausage. We grilled. 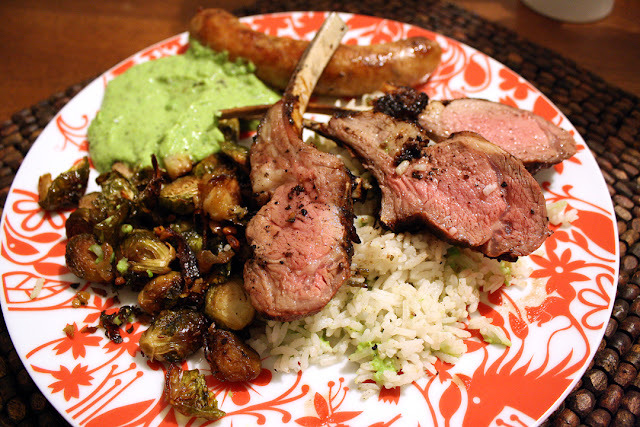 We served the lamb over mint-infused jasmine rice with a minted English pea puree and roasted brussels sprouts. I have actually shared this particular recipe before but with much less ado. It’s a beautiful, fresh and simple recipe and one that really showcases a truly gorgeous piece of meat. What, you thought I'd show you a picture of the birdcage? No way! You might could send me up the river! *P.S. Picture of Maggie in "full-on burgle gear" may be provided upon request. In the food processor, drop garlic, add cumin, cardamom, lime juice, salt, pepper and oil. Pour into a large bag or container to marinate (a couple hours or up to 2 days). On the grill is a must, and with a medium flame they'll be done in about 4 minutes per side. Perhaps a bit more but rarer is better. Great post! I've recently discovered your blog and from reading this, I'm pretty sure I have been missing out on some good eats and stories (but not living under a rock haha)!